The Erdesz Gallery has been open since 1992 at its current location. The owners are Magdolna E. Ilosvai and László Erdész, who is a prominent figure in the artworks scene for over 30 years. The gallery has been operating in a three story building built 15 years ago and it is right in the heart of Szentendre. Szentendre is a picturesque little city 20 minutes away from the capital, located along the river Danube. Numerous art relics, museums and great restaurants can be found in the city that serves as home for more than 150 artist who live and work here. On the ground floor of the gallery is a design shop with the products of local jewelers and artists and articles of personal use for highbrow customers. On the second floor two exhibition rooms can be found with graphics, paintings and sculptures waiting for visitors. There are six exhibitions every year taking place in one of the halls. The third floor gives place to the peculiarities and a small roof garden which is the perfect place to rest with a one of a kind view to Szentendre. 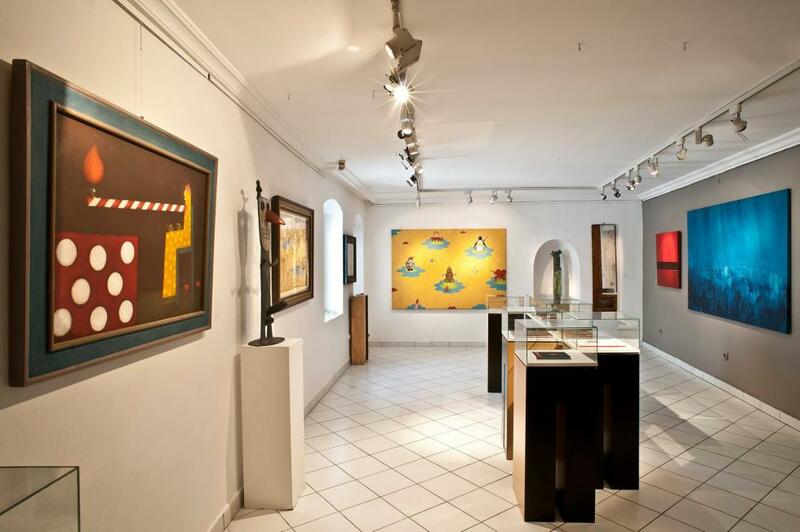 The gallery exhibits and sells classic modern (Kassák, Moholy-Nagy, Bortnyik) artworks, as well as pieces from the artists connected to Szentendre from The European School (Bálint, Korniss, Barcsay, Vajda) paintings, graphics and sculptures among other things. The gallery also displays the works of the outstanding artists of the contemporary generation. The gallery organizes 4-6 exhibitions a year while the Design part usually organizes one yearly exhibition. Erdesz Gallery also takes part in prestigious art exhibitions and fairs such as Art Cologne, Art Forum in Berlin, Art Basel, Palm Beach in the USA, Stockholm Art Fair and so on. Catalogs and books are also published by the gallery itself (László Fehér, Anna Margit, István efZámbó, Contemporary Silver- and Goldsmiths). While the ant was working diligently the cricket only cared for playing music. When autumn came both just died.